Entrepreneurs have long been taught that to be successful, they need to spend months perfecting a business plan and finding investors before they can finally launch their business. But with the marketplace changing at lightning speed, this notion is not only outdated-it's costly. There's no point to building a business in a bubble. 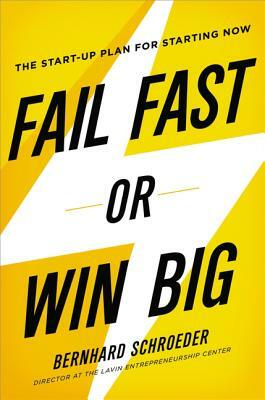 Today's entrepreneurs must embrace the idea of "failing fast." They need to connect with real customers and determine quickly whether their idea is worth pursuing, needs new direction, or should be abandoned altogether. Fail Fast or Win Big shows entrepreneurs how to: Create a rapid prototype of their product or service * Develop a business model instead of a business plan * Test it repeatedly with customers so they can spot failure early * Continue to refine the model based on customer interactions * Leverage their network and resources in order to run lean The longer it takes to launch a company, the more changes there will have been in the market place. Featuring real-life examples of entrepreneurs who set out to fail fast and ended up winning big, this ground breaking guide reveals how the right kind of risk can really pay off. BERNHARD SCHROEDER is a director at the prestigious Lavin Entrepreneurship Center at San Diego State University. Previously a senior partner at CKS Partners, the world's largest integrated marketing communications agency, he has served as a marketing and brand expert for successful start-ups such as Amazon and Yahoo as well as Fortune 100 firms such as Apple, Nike, Kellogg's, GM, and American Express.